Kemmangundi : Also known as K.R. Hills after the Wodeyar King - Krishnaraja Wodeyar, who had made it his favorite summer camp, Kemmangundi is at a height of 1,434 meters and is surrounded by thick forests and a salubrious climate through out the year. It is surrounded by the Baba Budan Giri range and blessed with silver cascades of mountain streams and lush vegetation. Its beautifully laid out ornamental gardens and enchanting mountain and valley views are a treat to the eye. Spectacular sunsets are a must see from various locations in the district, even from the Raj Bhavan. For the adventurous, Kemmangundi offers many peaks to scale and intricate jungle paths to explore. This place has a beautiful rose garden and other attractions. Kudremukh : 95 km southwest of Chikmagalur town is Kudremukh range, so named because of the unique shape of the Kudremukh peak. Overlooking the Arabian Sea, the broad hills are chained to one another with deep valley & steep precipices. Situated at 1,894.3 meters above sea level, Kudremukh is rich in iron ore deposits. The Kudremukh Iron Ore Company conducts mining operations, benefaction and transportation of the ore as slurry through pipelines to the port at Panambur near Mangalore. Mullayanagiri : Mullayanagiri is part of the Baba Budan Giri Hill Ranges here. It stands 1930 meters tall and is the tallest peak in Karnataka. Its height is famous mostly for watching sunsets from. It is 16 km from Chikmagalur town. Driving to Mullayanagiri is worth taking a risk. On the way is Sitalayanagiri where the water in the Shiva temple neither increases nor decreases. The road to Mullayanagiri is very narrow with a views from steep cliffs. Driving to the peak is not possible and includes a trek up the hill from the half way point. From the topmost point of the hill the Arabian Sea is visible on clear days. The small hillock in the temple compound is the highest point in Karnataka. It is a great trekking spot in Karnataka. Baba Budan Giri (Datta Peeta) : To the north of Chikmagalur town is the Baba Budan Giri Range or Chandra Drona Parvatha as it was known in the ancient times, which has one of the highest mountain peaks between the Himalayas and the Nilgiris. The peak takes its name from the Muslim saint, Baba Budan, who resided here more than 150 years ago. 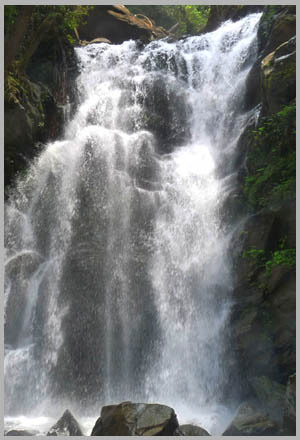 Manikyadhara Falls : It is a waterfall near the famous pilgrim centre Baba Budan Giri Dattatreya Peetha where water spills down like small pearls giving the visitors a memorable shower bath. Kallathigiri Falls : Just 10 km away from Kemmangundi is Kallahathigiri falls, also known as Kalahasti falls. Water cascades down from the top of the Chandra Drona hill from a height of 122 meters amidst fascinating scenery. There is an old Veerabhadra temple dedicated to Lord Shiva, constructed in a gap between rocks. This temple can be approached after crossing the waterfall. Hebbe Falls : This beautiful waterfall is over 10 km away from the famous hill station, Kemmangundi. Here water streams down from a height of 168 meters in two stages to form Dodda Hebbe (Big Falls) and Chikka Hebbe (Small Falls). Shanti Falls : This is a beautiful waterfall on the way to Z-Point in Kemmangundi. Hanumana Gundi Falls : Located 32 km. from the Kalasa, the waterfall has water falling on to Natural rock formations from a height of more than 100 feet (30 m). Kadambi Falls : This is a waterfall located in the Kudremukh National Park. Sringeri : 90 km west of Chikmagalur town is Sringeri situated on the banks of Tunga, a Vedic Peetha established by Sri Adi Shankara, the exponent of the Advaita philosophy in 9th Century A.D. It is famous for Vidyashankara Temple originally constructed by the Hoysalas and later completed by the founders of the Vijayanagar Empire and Sharada temple, an early 20th. century addition. In the Vidya Shankara shrine, there are 12 zodiac pillars, which are so constructed that the rays of the sun fall on the pillar corresponding to the month. Horanadu : Horanadu is 100 km southwest of Chikmagalur and has an ancient Annapoorneshwari Temple, which has been renovated recently. With the installation of the new image of Adi Shakti, now the temple is called Adi-Shaktyatmaka Shri Annapoorneshwari. The place attracts lots of pilgrims who are provided free boarding and lodging by the temple. Kalasa : Kalasa is 92 km southwest of Chikmagalur and situated on the banks of the river Bhadra. It is surrounded by lofty hills of the Western Ghats and is looked upon as one of the pancha-kshetras on the banks of the Bhadra. Close by are the pancha theerthas, the five sacred ponds. On a small hillock here is the Kalaseshwara temple in dedicated to Ishwara, with a Kshetrapala shrine of soap stone in Hoysala style nearby. The Madhawacharya bande, a large boulder at one of the theerthas here, is supposed to have been placed by Shri Madhawacharya the founder of the Dvaita school of philosophy. A statue of this acharya is carved on the upper portion of the rock. Guru Dattatreya Bababudanswamy Darga : Situated on the Baba Budan Giri is the Inam Dattatreya Peetha venerated by the Hindus and the Muslims alike. A laterite cave here is believed to have been sanctified by the residence of Dattatreya Swami as well as Hazrat Dada Hayat Mir Khalander. The worship here is conducted by a fakir and the annual jatra or urs is attended by both Hindus and Muslims with great fervors. Amritapura : 67 km north of Chikmagalur, Amrithapura is known for the Amritheshwara temple built in 1196 A.D by Amriteshwara Dandanayaka, a general of the Hoysala ruler Veera Ballala II. Delicacy of touch, originality of design and fine features have made this temple one of the notable structures of the Hoysala period. Belavadi : Located 29 km southeast of Chikmagalur town on the Chikmagalur-Javagal road and 10 km north west of Halebidu, Belavadi is famous for Ornate temple of Veeranarayana. Belavadi is also famous for the temple of 'Udbhava Ganapathi'. Bhadra Wildlife Sanctuary : Occupying 495 km². of wildlife sanctuary and Project tiger reserve, this region is an important watershed of the Tungabhadra river. The huge reservoir here is the main water supply to several districts in the rain shadow regions of south Karnataka. The forests here are rich in Bamboo and birds species unique to both the Malabar and Sahyadri ranges. Kudremukh National Park : The Kudremukh National Park (latitudinal range 13°01'00" to 13°29'17" N, longitudinal range 75°00'55' to 75°25'00" E) is the largest declared Wildlife Protected Area (600 km²) of a tropical wet evergreen type of forest in the Western Ghats. The Western Ghats is one of the twenty-five hot spots identified for bio-diversity conservation in the world. Kudremukh National Park comes under the Global Tiger Conservation Priority-I, under the format developed jointly by Wildlife Conservation Society (WCS) and World Wide Fund-USA.